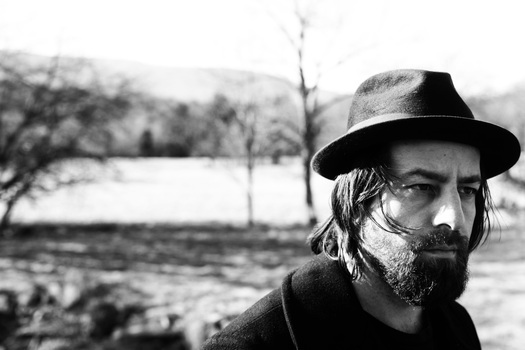 Sean Rowe is set to play a show at the Troy Music Hall April 12. The opener is MaryLeigh Roohan. It should be a very good show. We have a pair of tickets for the show -- and we're giving them away. But, wait -- there's more. The winner will also get two tickets to the pre-show reception/meet and greet with Rowe at the Rensselaer County Historical Society. But, wait -- there's more more. The winner will also also get a $25 gift certificate for The Confectionery, which is just down the street from the music hall. So, this is pretty much a whole night out. Because Sean Rowe is from Troy, and is back playing a show there, what's your favorite thing about Troy? It could be anything. We'll draw one winner at random. The show at the Troy Music Hall is on Saturday, April 12 at 8 pm. Tickets are $20 and up. It's a benefit for the Rensselaer Land Trust. Tickets for the show + meet and greet are $100. Important: All comments must be submitted by 10 am on Wednesday, April 2, 2014 to be entered in the drawing. You must answer the question to be part of the drawing. (Normal commenting guidelines apply.) One entry per person, please. You must enter a valid email address (that you check regularly) with your comment. The winner will be notified via email by 5 pm on Wednesday, April 2 and must respond by 5 pm on Thursday, April 3. The Troy Savings Bank Music Hall advertises on AOA, and AOA is a media sponsor of this show. The iced coffee from the stand (near the entrance, on the right, their name escapes me at the moment) at the farmer's market, in the warm weather! Makes fighting the kale crazed crowds worth it. That it's closer to Albany than Schenectady is. As an Albany resident, I can't help but love Troy for its tangible personality. Walking among its streets you get the sense that there's a unified vision for the city and that it's actually gaining traction. There's a type of enthusiasm for the place that I think is difficult to find elsewhere in the Capital Region. ...and also the Illium has some friggin' amazing paninis. The Community Gardens of the Capital District -- while they are based in Troy, I'm thankful their beneficence extends to Albany and beyond. The Ruck! and the Pig Out of course..
Finnbar's pub. I really, really love Finnbar's. Goojons and a beer = perfection. Bring on patio season! Actually, the Confectionary is one of my favorite things about Troy. Plus The Farmer's market. The amount of time, energy, and creativity that has gone on in the downtown to revitalize this great city. Historical, architecturally stunning, and now loaded with great restaurants and bars. Collar City has comeback! Lately my favorite thing about Troy is that they've figured out how to make good things happen. Troy's easier to spell than Odysseus. The passion that the residents have for their city and all the wonderful new things happening there. The fact that the hub of Troy's downtown remains adjacent to the river. It's so much nicer than being separated by highways, train tracks, etc. The rhythm of its rowhouses and commercial buildings, and the interesting and friendly people I have met in them! My favorite thing about Troy is Dinosaur Barbeque. Those little cornbread muffins make fasting for a day to prepare (mentally and stomach-ally) for an overindulgent dinner at Dinosaur totally worth the wait! (The farmers market is pretty great, too, of course). I second the Capital District Community Gardens. The Farmer's Market and walking around/window shopping downtown. I love Albany, but I also like Troy, and I would argue that the Troy night scene is a lot better than Albany's. Too many wannabes in Albany, and too many NIMBY people holding up change and progress. The people....the restaurants....the businesses.....you don't just think of one thing, Troy has totally come into its own:) However, The Victorian Stroll, The Placid Baker and Jose Malone's are awesome!!!!!!! The architecture downtown is my favorite part about Troy! I like that there are very few tourists here in Troy. It's our city, certainly not the best, but it's real and we don't have to share it. Our city leaders must feel the same way. I'm sure they are working late nights in smokey back-rooms to keep the place from becoming another Aspen or Prague or Clifton Park. The brand-spanking new Underground Athletics wrestling gym and massage parlor on River St. Grew up outside of Troy, Troy High girl. I like Browns where everyone knows your name. People are real. The Victorian buildings fascinate me. Also the Troy library and Russell Sage library are faves. Park Pub at Frear park is great in the summer. And a lot of my good friends live there. Oh yeah Rock in on the River. My favorite thing about Troy is the amazing community alongside everyone's love of what they do, genuinely everyone I meet who is either working or learning in Troy is seriously engaged in life and their own pursuits. I love people and this town has got some of the greatest personalities. I like how they make use of their riverfront. The farmers market. And the shirt collars. The view of downtown, the river and adjacent towns from Prospect park. The murals in the Illium cafe are a hidden treasure. TNO, Farmers Market, Defazio's, Prospect Park. Waking up Saturday morning after a fun night of Troy night out and walking to the farmers market to have breakfast with the love of my life. There is truly nothing better in life. So much to choose from - but mainly, the feeling that if there's something you want to do in Troy, you can make it happen!! It's Troy's water. But I would I could kayak on Tomhannock. As a Troy resident I'm tempted to say my apartment... but I think I'll have to go with how walkable the city is. I don't know anywhere else that's got so much to do in such little space without feeling crowded or frantic. Chowder fest, Brown's, Illium Cafe. I love the architecture of the buildings. My favorite thing from Troy is that Sean will be back playing a show. It's such a quaint little city with the most wonderful restaurants and activities. My favorite thing about Troy is the food! My family and I often enjoy dinners at Brown's or Bacchus and Sunday brunches at Illium. Rensselaer Land Trust keeping our water clean and our land protected! The people of Troy ,the business owners , the wonderful sense of community. I love that the city does so much to bring people in! Downtown is thriving and full of personality and energy. Troy Night Out and the farmers market, especially in the summer. As a recent transplant, the amazingly rich history of this town, its buildings and its people. Being from 'Cuse originally, where we have a huge year-around farmers market, I'd have to say the Troy Farmer's Market. It's really an amazing scene of personality, flavor and it makes me feel at home. I love how Troy is unexpectedly great to people who are not from here or haven't been here in a while, because of it's awesome downtown/riverfront/restaurants. Placid bakers croissants, the vibe at the farmers market, dino bbq, and the empac building!